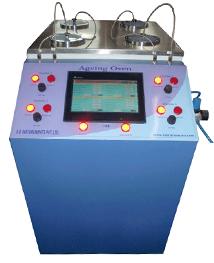 Thermal Ageing Oven as per IEC & IS - S.S. Instruments Pvt. Ltd.
Thermoplastic and Poly vinyl Chloride substances when exposed to heat undergo many types of physical and chemical changes. The extent and type of change that takes place depends upon the severity of exposure of the sample to heat (i.e., temp. range), duration and rate of air flow. Packing : One Wooden Box, 28 x 28 x 36 (LBH in inches), Weight 120 kg. Each Cell of Thermal Ageing Oven is a complete instrument in itself i.e., fitted with individual Temp. 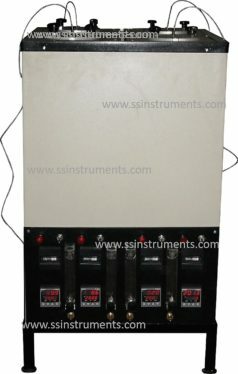 Indicating Controller, Air Flow Meter, Air temperature controller and an Hour Meter. This enables the user to test different type of samples at desired temperature and duration, depending upon test requirement of end users & testing authorities. A double walled chamber with inside chamber of thick aluminum sheet. Size of the chamber is 100 mm dia. x 300mm ht. Jacket type heater for the chamber. Digital Temp. Indicating Controller with sensor. Temp. range 0-200 ± 2oC. Rotometer for controlling the volume of air passing through the chamber. Specially designed split top cover to hold three to five test samples in each chamber. Hour Meter to record the total time of test. To operate the Thermal Ageing Oven unit Compressed Air line is to be provided by the customer. If the customer is using his own air compressor, it may require one pressure regulator, pressure gauge & connecting pipes which are available from us. The test requirement is 8 to 20 air changes per hour, measured on a Flow Meter. According to IS standard, if the Oven does not have a regulated air supply, the oven is then termed as a Hot Air Oven and not a Ageing Oven (as offered by some manufactures) and cannot be used for ageing of samples. After ageing in the ageing test oven for specified temp. & duration the samples are to be tested on Tensile Testing Machine for tensile & elongation. 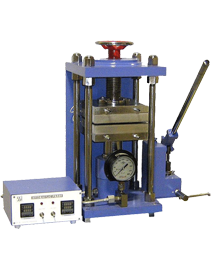 For preparation of Dumb-bell shaped samples, you may require hydraulic hot press, dumb-bell dies, dumb-bell cutting press, two-roll mill etc. Please ask for details.